DiTerlizzi, T. (2008). Kenny & the dragon. New York, NY: Simon & Schuster Books for Young Readers. A rabbit, dragon, and a badger all friends? 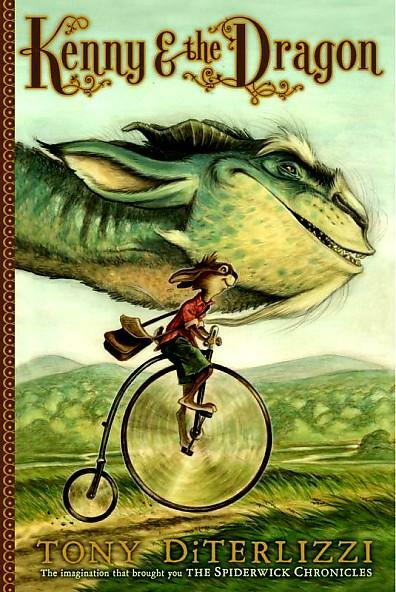 After Kenny Rabbit learns that there’s a dragon in Roundbrook village and reads up on dragons from the books he obtains from his friend George the bookstore owner, he ventures out to see the beast armed with kitchen pots and utensils and the King’s Bestiary to meet the dragon. Instantly Kenny and the dragon Grahame become best friends. When townspeople discover the dragon, and insist on destroying it, the king, who calls on his most famous knight George for help, who must come out of retirement, to slay the vicious beast. Kenny has to figure out a way to save his new friend Grahame. Distraught Kenny shares his knowledge of the dragon with his friend George in hope for help, and Kenny is utterly surprised when he learns that George is a dragon-slaying knight. Still, Kenny introduces George to Grahame and the two instantly become friends since Grahame and George share a love for history and reading. In attempt to keep the dragon, but not entirely disobey the king, George, Kenny, Grahame, and Kenny’s parents help device a fun and creative publicly viewable fake slaying. Kenny Rabbit struggles with fitting in, loves books, studying, is brave, inquisitive, and makes peculiar friends. The adults in the story such as Kenny’s parents and George the book keeper/dragon-slaying knight display wisdom and intelligence beyond that of books. The brilliant and gentle dragon Grahame, loves conversations, likes poetry, music and crème brûlée and wouldn’t even hurt a fly. Kenny & the Dragon is a delightful, descriptive, and creatively new tale of St. George the Dragon. It is a lovely story about compromise, trust, friendship, and loyalty told with wonderfully gorgeous illustrations drawn by DiTerlizzi.